Make sure to inspect the tires on your vehicle regularly this winter. The tread, air pressure, and overall condition are all things to check. A tire’s tread helps it to maintain traction with the road, especially in wet or icy conditions. The specific pattern of the tread determines the conditions for which the tire is best suited. The treads on rain tires are generally V-shaped, allowing them to quickly channel water away from the tire’s driving surface. The rubber on the driving surface of the tires wears off with use, which reduces tread depth over time. Tread depth may be measured in sixteenths of an inch, when their tread depth is less than 1/16 inch, new tires may be required. A deeper tread is needed in snow to maintain maneuverability and control. Wet surfaces also require a greater tread depth to avoid hydroplaning, a condition that prevents tires from getting any traction all. Most tires have at least six wear bars, although tires with a rim diameter of 12 inches or less may have as few as three wear bars. Wear bars are a series of raised features in the bottom of the tire tread, which create a specific pattern in the molding of the tire. They typically have a height equal to the minimum tread depth allowed for the tire, typically 1/16 inch. Tire cracking is generally the result of tire age, although there are several other causes that may also result in the premature cracking of your truck tires. Tires that are not in use will also crack overtime, due to the fact that electric motors can create ozone that degrades the rubber in tires. Typically, tire cracking occurs on the sidewall of the tire, as opposed to other areas of the tire. Factors such as excessive heat, exceeding a tire’s load limit and the improper use of cleaning chemicals may also crack your truck’s tires. 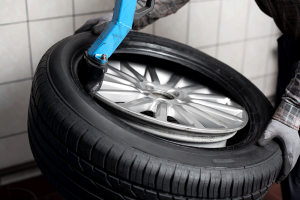 To ensure your tires are being properly maintained, it’s important to have your vehicle’s tires rotated. An easy way to remember to have your tires rotated is to request a rotation every other time you receive an oil change. Tire rotation is necessary as your vehicle’s front and back tires are generally used for different things; your front tires are responsible for steering the vehicle, while back tires are generally more stationary in terms of lateral movement. Therefore, rotating your tires ensures the wear of all the tires on a vehicle will remain relatively consistent. If you notice an issue with the tires, make sure to inspect the tires to see if you notice anything. You can also bring the vehicle in and we can inspect the tires for you. So stop on by Dale Feste Automotive and let us inspect the tires today. This entry was posted in Auto Repair, Car Care Tips, Inspect the tires, Tire Repair. Bookmark the permalink.